The Canon Pixma iP5300 is one of the third generation of Pixma models that are pushing competitors such as HP, Lexmark and Epson to the limit in terms of their speed, print quality and versatility out of the box. The device uses Canon's 3-size droplets technology to deliver more accurate images. The Canon Pixma iP5300 ink cartridges has five colour ink tanks at a reasonable price and page yields are also good. The printer has stylish looks weighing 14.99 lbs and measures 17.5 x 11.9 x 6.3 inches respectively.The device features an automatic duplex unit for double-sided printing. It also allows users to print directly on CDs. The device also incorporates a double encoder system for faster print speeds. It also supports direct printing from the digital camera through PictBridge port. The device is capable of printing on different medias which include envelopes, plain paper, iron-on transfers, photo paper, semi-gloss photo paper, photo stickers, glossy photo paper, cards, matte photo paper, two-sided photo paper, high-resolution paper, DVD discs and CD discs. It is capable of printing borderless 4x6 inch photos in just 21 seconds. The printer has dual paper trays, one is the input tray and the other is paper cassette tray, both are capable of handling up to 150 sheets of paper. The printing resolution of this device is up to 9,600 x 2,400 dpi with print speed up to 31 ppm for monochrome documents and 24 ppm for colour files. Canon Pixma iP5300 uses Canon's 3-size droplets technology to produce more accurate images. This printer is a significant improvement over the other Pixma models lying in the same range. It includes an automatic duplexing unit for double-sided printing and also supports double encoder system to deliver printouts at a faster speed. The Canon Pixma iP5300 ink cartridges have five colour ink tanks, which leads to the low running cost of the printer.However, it lacks wireless connectivity option and mobile printing which are the major advanced features that consumers look for. Canon Pixma iP5300 is a color inkjet printer. The printer is shipped with Canon Pixma iP5300 ink cartridges. The printer offers WiFi connectivity and has a high print quality. But at times you will observe blurry prints, horizontal or vertical banding or wrong colours getting printed. Take a nozzle check pattern print to check if the ink is ejecting properly from the print head nozzles. If the nozzle check pattern is blurry, has gaps or is faded then there is a problem with the print head nozzle. The nozzle is clogged and ink from Canon Pixma iP5300 ink cartridges is not flowing properly. There is a possibility that the cartridge is low on ink. You need to run a print head cleaning cycle. Take a nozzle test pattern print again to check if the pattern is correct. If not then repeat the nozzle cleaning cycle. You will need to run this cleaning cycle four to five times until the nozzle test pattern print will come out correct. If the problem remains then leave the printer turned on overnight. This will loosen up the clogged ink in the nozzles and clear the path. The following morning, take a nozzle test pattern print to check if the problem is solved. Try replacing the present Canon Pixma iP5300 ink cartridges with new ones. The cartridge might have some defect. Instal the new ones and take a test print. You should also check the quality of paper that is being used for printing. First of all, check if the printable side is being printed upon. If not then turn the paper. The quality of paper is also important. Make sure that the paper quality in the paper tray matches the specification in the printer software. Q. Will I receive ink cartridges when I buy a Canon Pixma iP5300 printer or do I have to buy Canon Pixma iP5300 ink cartridges separately? A. Yes, you will receive a pack of starter ink cartridges, when you buy a brand new Canon Pixma iP5300 printer, that are made specially for the installation of the printer. When you install ink cartridges in the printer for the first time, ink is charged into ink heads. You can buy more ink cartridges when the starter ink cartridges run out. You can find a range of Canon Pixma iP5300 ink cartridges on our website. Q. How is the print quality of Canon Pixma iP5300 printers? A. The print quality of Canon Pixma iP5300 printers is extremely good since the device uses Canon’s 3 size droplet technology. The iP5300 printer can print up to a high resolution of 9,600 x 2,400 dpi. Q. How do I replace Canon Pixma iP5300 ink cartridges with new ones, once they are empty? Make sure that the printer is on. Open the paper output tray and the top cover. Push the tab of the ink cartridge whose lamp is flashing fast and remove the ink cartridge. Remove the new ink tank from its packaging, then pull the orange tape downwards so that the protective film does not remain on the air hole. Then remove the protective film completely. Remove the orange protective cap and discard it. Insert the front end the of new ink cartridge in the print head and slowly push the bottom end until the cartridge snaps firmly into place. Make sure that the lamp lights up red. Close the inner cover and then the top cover. Q. 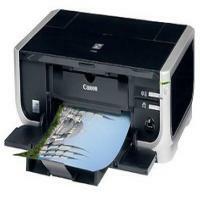 Do you also provide a paper that can be used with Canon Pixma iP5300 printers? A. Yes, we provide envelopes, A4 size plain paper, glossy photo paper, double sided glossy photo paper and matte paper that can be used to print on with Canon Pixma iP5300 printers. Q. I had recently ordered a yellow Canon Pixma iP5300 ink cartridge for my printer. However, I noticed that the ink cartridge was damaged and unusable. What should I do to arrange for a replacement? A. We are very sorry for the inconvenience caused to you. Please contact us on 048 30833221 or email us on info@printerinkcartridges.ie within 30 days of receiving your product with your invoice number and order details ready. Q. While printing through Canon Pixma printer, I noticed dark prints. What should I do to settle this issue? A. At a point when the print results are not up to the mark, the only real way to enhance the print results is to first lighten them using a piece of photo editing software. A decent choice would be Adobe Photoshop elements, yet there are other free alternatives also. Do a google search to get free photo editing software. Q. What OS is my Canon printer good with? A. To identify the compatibility of your item with a particular working framework please tap on the driver's tab. You will then either be presented with the compatible driver to download or a message describing the compatibility status of your product. Q. What should I do, if the print quality degrades with time? A. There are a number of steps you can take to solve this problem. Generally, poor prints are due to clogged nozzles or due to non-genuine Canon Pixma iP5300 ink cartridges. Q. Can I print directly from my digital camera to my Canon inkjet printer? A. To print directly from a digital camera to a Canon inkjet printer, both devices need to be PictBridge enabled. PictBridge is an industry standard technology that lets you transfer pictures from your digital camera to your printer without a computer or image-editing software needed in between. Q. How many Canon Pixma iP5300 ink cartridges are supplied in a single pack? A. We are supplied with 5 cartridges in a single pack that are: CLI-8B Black, CLI-8C Cyan, CLI-8M Magenta, CLI-8Y Yellow and PGI-5 Black.